Officials break ground for the 12.3-mi. $1.5 billion Foothill Gold Line extension. Preliminary work started Dec. 2, 2017 on the $1.5 billion, six-station Foothill Gold Line light rail expansion from Glendora to Montclair. The extension spans 12.3-mi. Crews constructed the first segment from Union Station to Pasadena in 2003 and the Pasadena to Azusa segment in 2015 — both on time and under budget. And now comes segment three, a complex nine-year project that will extend service to Montclair in southwestern San Bernardino Valley. The project is expected to improve mobility in the area by reducing freeway traffic, improving public transportation and encouraging construction of transit-oriented communities near the rail lines. 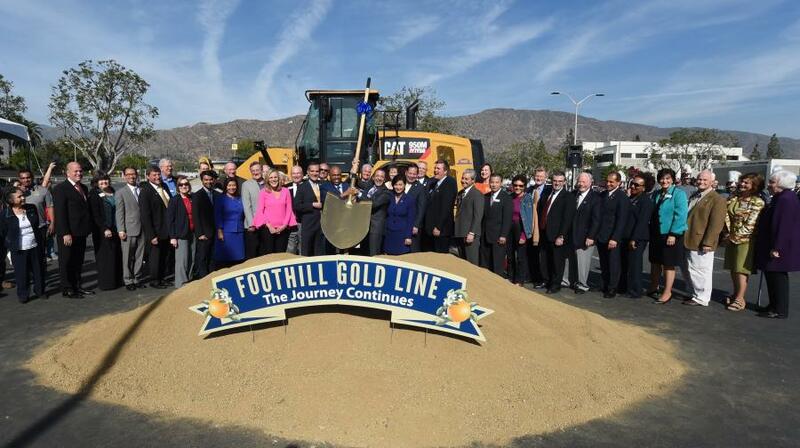 The Foothill Gold Line Construction Authority held a ceremony marking the latest Foothill Gold Line extension as the first Measure M-funded rail project to begin construction. L.A. County voters passed Measure M in 2016. Measure M contained multiple projects aimed at improving travel and public transportation in the county. The first three years of Gold Line project construction will be used to relocate strategic utilities, conduct pre-construction activities, hire a design-build contractor and finalize the project design. Major construction will begin in 2020 and consist of two construction phases. The first phase will involve relocating and rebuilding the freight-Metrolink systems. Phase II features constructing the Gold Line light rail system. Substantial completion is anticipated in 2026. In addition to laying tracks and installing the overhead electric systems, crews will build parking facilities at all six stations including spaces for electric vehicles, bicycle parking and bus and drop off areas. They will construct 26 new street-level rail crossings and either install or renovate 25 bridges. Each light rail car will have a capacity of 200 passengers. Trains will consist of two or three cars. Maximum speed is 55 mph. Building the system is complex, requiring extensive planning and coordination. “The Construction Authority's team has been working tirelessly over the last few years to ready the Glendora to Montclair segment for construction,” said Habib F. Balian, Foothill Gold Line CEO in a release. The construction authority hired W.A. Rasic Construction of Long Beach, Calif. as contractor for utility relocation. The hiring process for the project's Alignment Design-Build Contract is under way but will take about a year to complete. It is considered the main contract for the project. The $750 million Alignment Design-Build Contract is now under procurement. It features a multi-step, competitive process. A request for qualifications was released to the industry in early November 2017 and will result in a short-list of the most qualified teams to compete for the work. The request for qualifications requires interested teams and firms to detail their qualifications to complete all elements of the light rail project. Statements of qualifications are due in January 2018. The contract is expected to be awarded in October 2018. 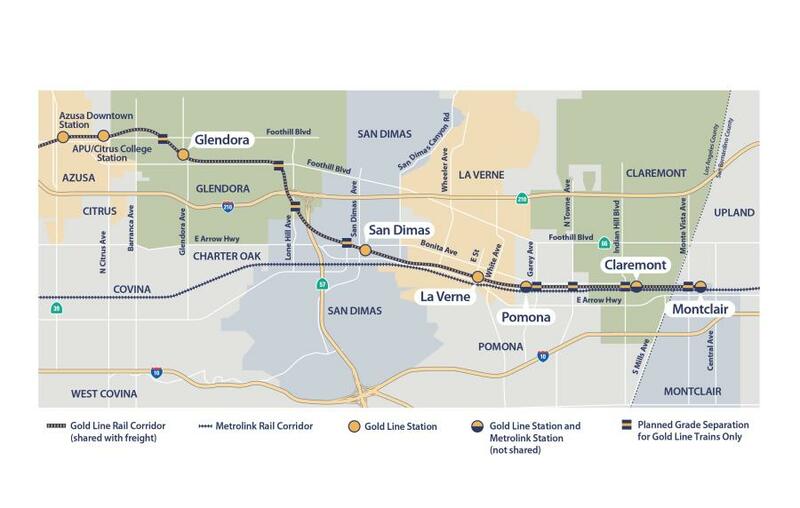 When completed, the Glendora to Montclair project will extend the Metro Gold Line light rail line from its eastern terminus in Azusa through the foothill communities in the San Gabriel Valley and into San Bernardino County, adding new light rail stations in Glendora, San Dimas, La Verne, Pomona, Claremont and Montclair. Each will connect to the expanding rail network in Los Angeles County, as well as the Inland Empire, and provide opportunities for county residents, workers and visitors to connect to many regional and local points of interest along the corridor, including two dozen colleges, the Los Angeles County Fairplex, several outdoor recreation facilities, historical sites and museums, and retail and dining centers. The Glendora to Montclair segment will be built along the former Atchison, Topeka and Santa Fe (ATSF) right-of-way and will share the 100-ft.-wide (on average) rail corridor with freight throughout and Metrolink from Pomona east to Montclair. While the different rail services will share the corridor, they will not share tracks or stations. The Foothill Gold Line will run on its own two tracks (one for eastbound and one for westbound trains) with overhead electric lines called catenary wires, to power the trains. BNSF and Metrolink both operate diesel-powered locomotives. They will continue to run on their own dedicated tracks, to be relocated within the shared corridor as part of the project. Funding for the project comes from both Los Angeles and San Bernardino Counties. 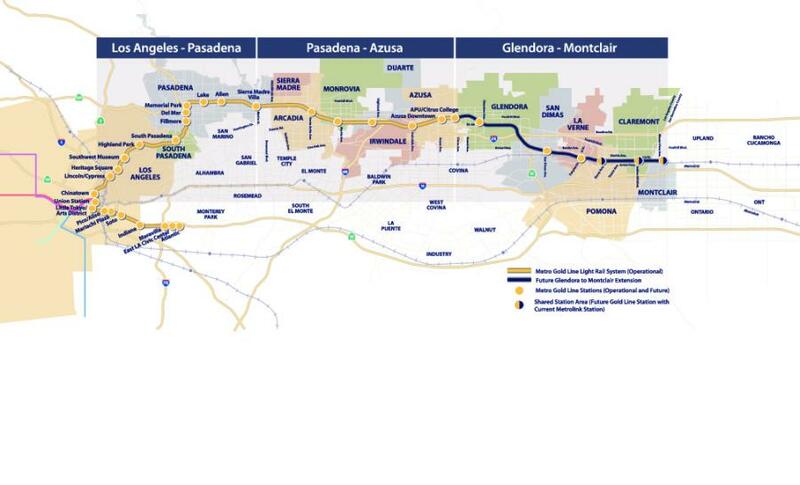 The portion of the project within Los Angeles County (Glendora to Claremont) is being mostly funded by Metro's Measure M half-cent sales tax, as well as residual Measure R funds from the Pasadena to Azusa segment. The portion of the extension from Claremont to Montclair is being funded by San Bernardino County. The project is expected to bolster the area economy. Construction alone is expected to generate $2.6 billion in economic output, 17,000 jobs, more than $1 billion in labor income and nearly $40 million in tax revenues for Los Angeles County. Nearly $2 billion in private investments in transit-oriented developments have already been made or planned within a half-mile of the six future stations from Glendora to Montclair. The first three years of the project will see construction in several locations along the corridor and minor community impacts. Once major construction begins in 2020, the community can expect temporary construction impacts, including extended street closures at street crossings, short-term lane closures. The community also can expect noise, mostly from construction vehicles during limited construction hours. Community notifications will be provided ahead of construction impacts starting. Glendora: In Glendora, new light rail bridges will be built over the intersection of Foothill Boulevard and Grand Avenue, at Lone Hill Avenue and at Route 66 where the existing freight bridge also will be relocated and rebuilt as part of the project. West Ada Avenue will be permanently closed near the Glendora Station and made into a cul-de-sac; and either Elwood Avenue or Glenwood Avenue will be permanently closed. The closures, aimed to improve safety along the corridor, are required by the California Public Utilities Commission. While moving east through Glendora, the rail line will run parallel to Route 66 and the I-210 freeway for a time, then shift south, crossing over the freeway, before heading east toward San Dimas. San Dimas: In San Dimas, a new light rail bridge will be built over the Bonita and Cataract Intersection, requiring the permanent closure of Monte Vista Avenue at the railroad crossing. La Verne: In La Verne, the California Public Utilities Commission is evaluating whether the Gold Line tracks will need to be grade-separated on a bridge over White Avenue (more information will be known in the coming months). Freight and Metrolink tracks would remain at-grade (street level). Pomona: In Pomona, new light rail bridges (for the Gold Line only) will be built over Garey and Towne Avenues. Additionally, the California Public Utilities Commission is likely going to require changes to the Pomona North Metrolink Station access from Fulton Avenue; minimally restricting turns in and out in the future and possibly requiring a full closure of the driveway (more details will be available in the coming months). Claremont: In Claremont, the Metrolink station will be moved from its current location west of College Avenue, several hundred feet east of College Avenue and the Gold Line tracks will be grade separated on a city-designed bridge over Indian Hill Boulevard. Montclair: Minimal permanent changes are anticipated in the city of Montclair.